It’s always a good thing for a baseball team when fans and those covering the team start talking about magic numbers. The “magic number” is the number of Tourists wins combined with losses by another club (in this case, the Charleston River Dogs) that will allow Asheville to clinch first place in the South Atlantic League’s (SAL) Southern Division. After Thursday’s 7-1 win over Kannapolis to complete a three-game series sweep, the Tourists’ magic number is now down to one, putting the team on the verge of clinching its second playoff berth in three years. With an Asheville win and Charleston loss on Thursday, we could be celebrating a division title and playoff berth for our local baseball team. The T’s play a three-game set in Delmarva this weekend, which means the team will likely clinch on the road. It would certainly be more fun to have it happen at home, but you can welcome the Tourists home as conquering heroes next Tuesday, Aug. 26, when they begin their final homestand of the season. That is, unless we just jinxed the whole thing by writing about it here. But I don’t think we have that kind of power here at Ashvegas. After outfielder David Dahl was promoted from Asheville to Advanced Class A Modesto in late July, the possibility of returning to the Tourists for the playoffs appeared to be a strong possibility. Dahl himself mentioned this in an interview with The Modesto Bee soon after his promotion. The move is all but official now. The Bee‘s Brian VanderBeek spoke with Jeff Bridich, the Colorado Rockies’ senior director of player development, who confirmed that Dahl would be returning to Asheville soon. Dahl spent a week on the temporary inactive list because of a wrist injury. He’s been dealing with the wrist issue for a while, but aggravated the injury while running into the center field wall trying to make a catch. Dahl was reactivated on Saturday and has batted 5-for-14 (.357) in three games since his return, so he appears to be fine. Going back down a level usually isn’t a good sign for a player, but in this case, it’s a reward to Dahl for a fine season. It’s obviously a reward to the Tourists as well, providing reinforcements for their playoff run. Interestingly, the Rockies also wanted to shuffle shortstop Pat Valaika — who was promoted to Modesto in mid-May — back to Asheville for the late-season playoff drive, but the SAL said it would not approve the move. According to VanderBeek, leagues are starting to crack down on the practice of moving players back and forth to help postseason chances. The guess here is that Dahl’s move was approved because he played 88 games for the Tourists this season, while Valaika appeared in 34 before being promoted. Former Tourist Todd Helton turned 41 on Wednesday. The Rockies’ all-time franchise leader in hits, extra-base hits, doubles, home runs, RBI, and walks (and I’m probably overlooking one or more other categories) had his No. 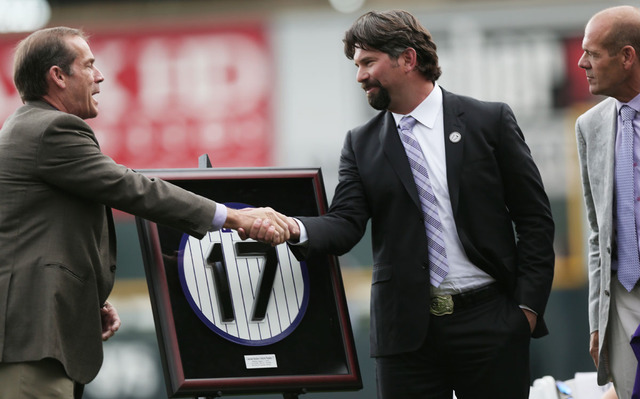 17 retired by the team on Sunday in a pregame ceremony at Coors Field. He is the first Rockies player to receive the honor. Helton played for the T’s in 1995. The Knoxville, Tenn. native and University of Tennessee alum was the Rockies’ first-round pick (No. 8 overall) that year and went straight to Asheville for his first season of professional baseball. He appeared in 54 games with the Tourists, batting .254 with one home run and 15 RBI in 227 plate appearances. The following season, Helton played at the Class AA level and never looked back, earning a call-up to the major leagues in 1997. There won’t be a July 4 game at McCormick next season, as the Tourists will be in Lexington. But the team will have its Independence Day celebration and fireworks on July 3, when the T’s host Charleston. Don’t forget — McCormick Field is hosting the SAL All-Star Game on July 23. You can view the Tourists’ 2015 schedule via PDF here, and begin to plan accordingly. Game times and promotional schedules will be announced at a later date. 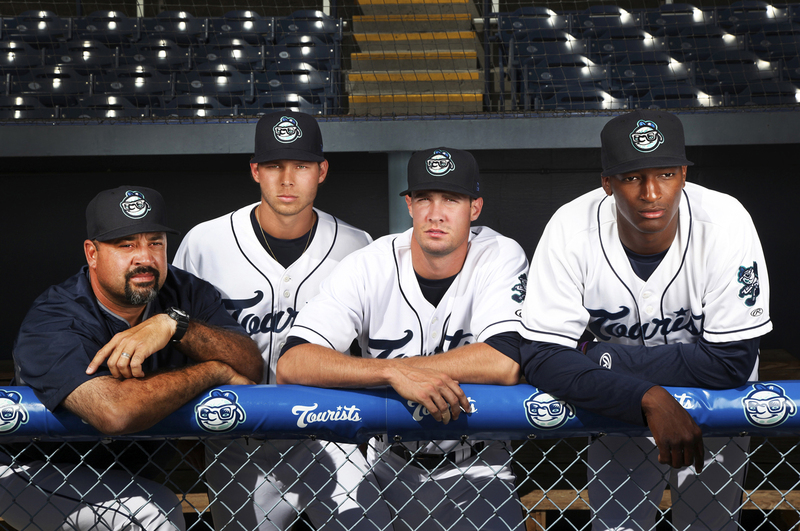 *** The Asheville Tourists return to McCormick Field for the final three home games of the regular season on Aug. 26 (a Thirsty Thursday!). The series against the Hagerstown Suns includes the final Thirsty Thursday of the season on Aug. 28. Single game tickets are currently available at the McCormick Field box office. For more information, contact the Tourists’ front office at (828) 258-0428. The number 42 is the only one that is retired in both (majors and minors) – in honor of Jackie Robinson. The number 50 is retired in the entire South Atlantic League in honor of former league President John Henry Moss and his 50 years of service to the SAL. 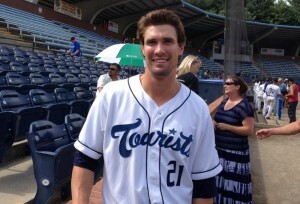 Former player and Manager Joe Mikulik’s #20 is the only other jersey that the Tourists have retired. Question: When a major league club retires a number, does it also get retired at all minor league levels? Great question. My guess is no, but I’ll try and get an answer on that.